We have featured many minimal protective cases for iPhone 5, but if you need an ultimate option, the Radius minimalistic iPhone 5 case may be more suitable for you. The Radius is a simple and unique protective case that weights only 0.155 ounce, and designed for iPhone 5. 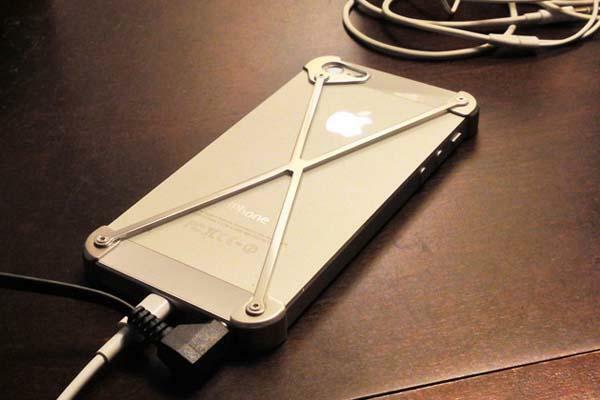 As we can see from the images, the iPhone 5 case features ultra minimal design, and consists of the corner modules and the X frame that holds them together, moreover, all parts are carved out of solid billets of aircraft grade aluminum plus beveled corner modules in order to protect your iPhone 5 from bumps and scratches in a minimalistic way. Apart from that, this kind of minimal design won’t disturb you to use your phone, and all buttons and functions of your iPhone 5 are accessible. After the break, check out the following installation video. The Radius iPhone 5 case is priced at $69.99 USD. If you’re interested, jump to BiteMyApple online store for more details. Additionally, also don’t miss other nice options via “iPhone 5 case” tag.